We talk about trigeneration if a CHP unit is supplemented with an absorption chiller unit that allows to transform the heat from cogeneration to cold. A frequent example of the use of trigeneration is the generation of heat in winter months and generation of cold in the summer. Besides that, the simultaneous generation of all the three forms of energy at the same time is possible. The trigeneration can be run anywhere, where the delivery of cold is required, e.g. air conditioning of production or office spaces or generation of technological cold. TEDOM Cento CHP units complement the heat part of an energy centre and generate electricity. If required, they can also serve as a standby power source (emergency mode). In the case of an increased withdrawal of cold, an electric cooling compressor runs in addition to the absorption units. 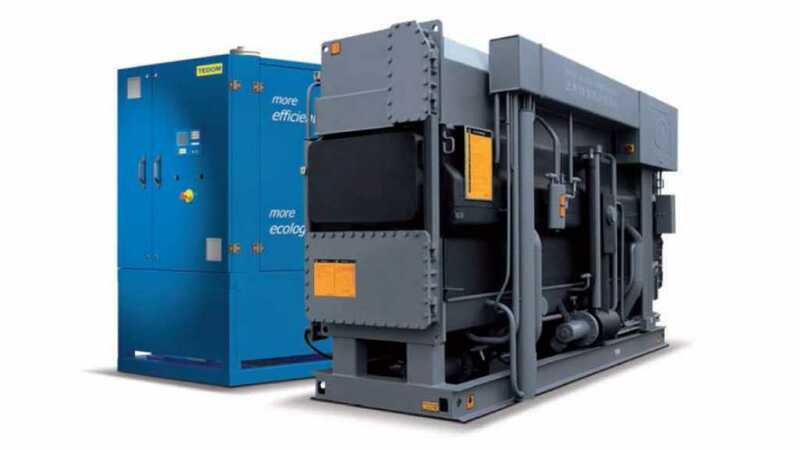 The trigeneration system reduces the heat offtake from the heat exchanger station of the heating plant, reduces the cost of electricity needed for indoor air conditioning and generates electricity for its own consumption. The BROAD BDH absorption refrigeration unit enables the maximum use of CHP units even in the summer months. Function: year-round air conditioning of GONG multifunctional hall and "World of Technology". TEDOM Cento CHP units generate the electricity needed to operate the administrative building; the heat in the absorption refrigeration units BROAD BDH (3x) is used for the production of the cold needed for the air conditioning of the building. TEDOM Cento T200 SPE CHP units (2x), running since 2014. Function: Air conditioning of public building. The foundation of the energy centre in Sydney airport is a trigeneration, consisting of two CHP units with total electric output 2 x 4,300 kW, two exhaust gas absorption refrigeration units of a total cooling output 2 x 3,310 kW and one heat water absorption unit of cooling output 2,646 kW. The cold is used for air-conditioning of the airport buildings, the electricity from the CHP units, which are in operation at a high tariff, is supplied to the grid. This greatly contributes to reducing the cost of cold production. TEDOM Quanto D4000 SPE CHP units (2x), running since 2013. Function: Air conditioning of part of Sydney International Airport premises.